Small Town Hostel is the perfect choice for those who want to have a pleasant stay in Buenos Aires without compromising their budget. Relaxed, comfortable and located just 5 minutes away from downtown, it hopes to be "your home in Buenos Aires". THE CHEAPEST BEDS IN SAN TELMO. Our hostel is the backpackers meeting point in BUENOS AIRES. s, really close to the most important and touristic places in the city. Free internet and breakfast and a vibrant atmosphere. Hostel en palermo Buenos Aires, Argentina. Santo Hostel is a totally refurbished 1930s three story home in the centre of Buenos Aires. ¿Alguna vez te imaginaste encontrar un lugar que reúna buen precio, excelente ubicación, comodidad y muy buena onda? Te damos la bienvenida a Reina Madre Hostel, Buenos Aires. Privates or shared rooms, big common area with TV, DVD, Playstation, Music, internet access, WI FI and the best location in Bs As. Located in the tango´s heart, we want to offer you the Buenos Aires lifestyle. Palermo House Sixth Anniversary!!! Conveniently located in the heart of Palermo Soho, just one block from Plaza Serrano, the trendiest and coolest neighbourhood in Buenos Aires!! The first tango thematic hostel in Buenos Aires! Great location in San Telmo. Excellent service and friendly and qualified staff to have lot of fun. Located in the heart of the city, Baires Adventure is a stay alternative for the independent traveler, a nice place to enjoy and meet people from around the world. 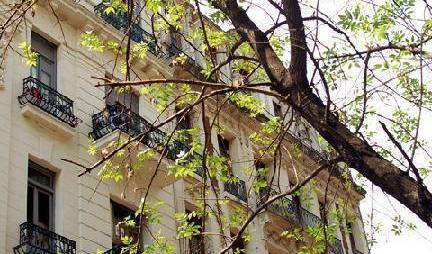 Situated at 200 mts from the historic "Plaza de Mayo" and one block from "Calle Folrida", the main pedestrian street of Buenos Aires, is "El Firulete Hostel". Come see how we've raised the standards in hostelling! THE BEST PLACE AVAILABLE IN BUENOS AIRES! Back in BA: best location in Palermo Soho, a warm and friendly place, bar, patio, regular asados (BBQs), friendly staff. It’s the hostel where you belong. We have created a different hostel, right in the heart of Palermo, to meet the needs of all our guests. Avenue Hostel - The best location hostel in Buenos Aires downtown! Air Conditioning, heater, ventilator, lockers in every room! shared kitchens, living rooms with TV cable, DVD, pool table! Hermosos monoambientes de categoría e las mejores zonas de Buenos Aires. Atendido directamente por los dueños. Themed Hostel. B&B. Superior, cultural place. The best in San Telmo! SKYLOFTY IN PALERMO SOHO APARTMENT 27 SQMTRS WITH TERRAZA 75 SQMTRS. SPOT BUENOS AIRES B&B is a concept involving guest service, hospitality and a ¨home away from home¨ feel. Argentina Tango Hotel is a 3 star hotel located in the downtown of BA (just 3 blocks from the Obelisco) and 1 from the largest avenue of the City (Av. 9 de Julio). We are located in one of the safest centric zones of Buenos Aires, one block away from the famous Corrientes and Callao Avenues, at three blocks from the National Congress and steps away from theaters, restaurants and cultural / entertainment complexes. Synergy is a new boutique hotel in Buenos Aires city, specifically located in the epicenter of design, fashion, arts and night life, PALERMO SOHO. 5411 Soho will provide you everything you need to make your stay a pleasant and unique experience. Whatever the purpose of your trip is, you will find here a place run by people willing to make your stay unforgettable. YOUR HOSTEL IN BUENOS AIRES!! Located in the Heart of the city. One of BA´s premier hostels. A legend among the backpacking fraternity and one of the best places to meet up, hook up, drink down and party in BA. Voyage Recoleta Hostel is a meeting place for young students and tourists from around the world. Best known as BA’s premiere party hostel, our stunning 19th-century colonial-style house is easily one of the city’s most lively and exciting hostels! Dreamhouse. Porteño Psychedelic Hotel for Friends, Artists & Freethinkers. Aquì sentiras el auténtico estilo de vida de Buenos Aires. Pax Hostel is the brand new hostel in Buenos Aires. It's located in San Telmo, one of the most beautiful places in the city (and you can be sure that there are a lot of beautiful places!). Hostal Tita Palermo, for lovers of comfort, style and good vibes. Breakfast and wi-fi incl, private bathrooms, a/c around all the hostel, kitchen and a huge terrace! Located in the most fascinating neighborhood of Buenos Aires. We are an excellent place for adventurers! Your Hostel in Buenos Aires ! Its a hostel owned and run by travelers, set in a newly restored old house located in San Telmo. Its 23 bed capacity creates a warm atmosphere. There are comfy dorms and private rooms. Welcome to SAN PEDRO TELMO HOSTEL, one of the most secure and comfortable hostel in the very heart of Buenos Aires! Circus hostel&hotel cover both segments of hostel and hotel through a combination of top level service and facilities with a multi-cultural and cozy atmosphere. Have Fun. Our Metro II, Bed & Breakfast style are a different and economical alternative for independent travellers. Small hotel that combines tango style in confortable rooms. Hostel Boutique in San Telmo. Warm service within a familiar atmosphere. Super-friendly and trustworthy staff. Immacualtely clean. This is a unique house where you're gonna be abble to experiment the typical suburbian life surrounded by nature only 20 minutes away from the city. In the center of Abasto Neighbourhood, a few metres far from Corrientes Avenue, Augur Hostel invites you to enjoy a place destined for Art, Good Music and Shows. En el corazón del Abasto, el barrio famoso por su rica historia del tango, Chez Seb Buenos Aires a su disposicion. Brand new apartment, fully furniture, close to major attractions, quiet and sunny! An inspired collision of daredevil design and commitment to modern comfort. Is a breath of the district's spirit that has materialized in the hotel's original rooms.